Mother’s Day 2014 has passed. Do you feel like a survivor, having endured another Mother’s Day? I remember how emotionally draining it was for me. Maybe that is why I haven’t even written about Mother’s Day but once. My husband didn’t take any offense in what she said or see it as negative; maybe it isn’t as personal for a man. I let her steal my joy, but I also hoped she meant well, and maybe at the time I was so concerned about not having what I wanted that I didn’t fully realize or appreciate how God was using me then. You see – there was truth in what that woman said to me. We didn’t have children, so we devoted our time and energy to that class, to those couples. We really loved them and wanted to see them grow in the Lord. The pictures at the top of this blog post are a card and a note I received for Mother’s Day in 2004 and in 2005 from two very young moms in our Adult Bible Class. In the card, this precious lady thanked me for what we had done for them, including giving baby showers, writing notes, being a friend. She said even though I was not her mother, she looked to me as a spiritual mom. I received the note a year later from another precious lady who, along with her husband, had been saved at our church. Her words were full of compassion and maturity, and she said they had been praying for a year and a half that the Lord would give us a child. She also said I was truly like the mother she never had. Those words are more precious to me now even though I was very touched by them the day I first received them. Looking back, God really did give us big babies. I am thankful God chose to use us in that capacity, and I trust our investment in those couples made a difference in their lives. I know it was not in vain. My encouragement to you is to realize and appreciate how God wants to use you right now – while you wait for your baby – whether you teach a class of newly married couples or 4-year old boys, help in the nursery, work a bus route, or find a teenaged girl who needs a mentor. The Lord may use you to impact someone’s life as a spiritual mom or a mom they never had. 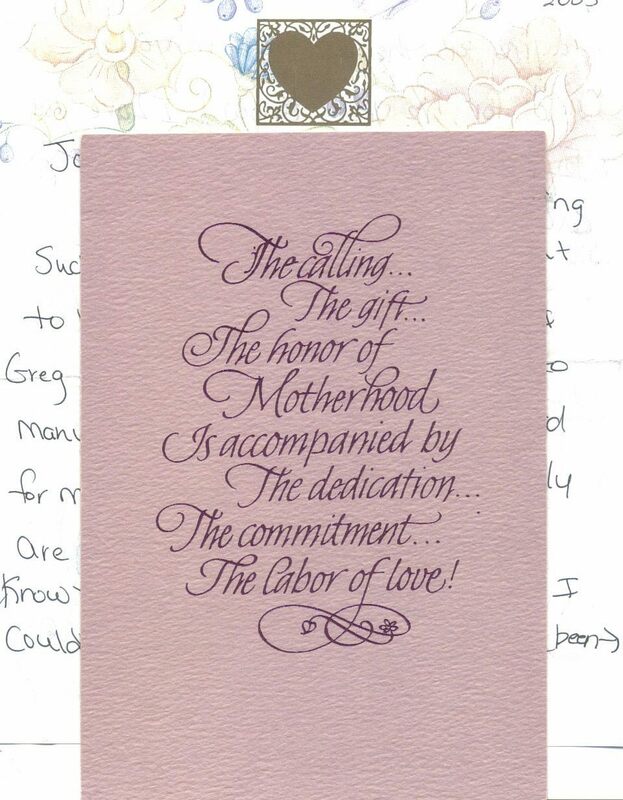 My wish is someday you will have a Happy Mother’s Day – from your “big babies” and from the baby you are waiting for. With the passing of another Mother’s Day, I was reminded of people for whom this day is difficult – not only women who desperately want to be mothers, but also mothers who have lost babies or older children who were supposed to outlive them, as well as others whose mothers have passed away. Most of all, I couldn’t stop thinking about a friend who has experienced infertility herself but encouraged me during my trial of infertility. You see, she never did get pregnant. I don’t know all of her circumstances and decisions that were made, but for whatever reason, she and her husband either weren’t called to adopt or perhaps those plans fell through also. I don’t understand why God didn’t open her womb. I wondered how could my blog help someone like her? Maybe it’s not supposed to be able to help everyone. But if you are in her shoes and you have stumbled upon this blog, I hope my words don’t ring hollow because God did open my womb, but He hasn’t done that for you. You might say I can praise Him because He did give me the desire of my heart – a baby. I can only say the thoughts I am sharing came before I knew what He would actually do in my own life. I do praise Him for my outcome. But if not, I would hope I could still trust Him, praise Him and keep serving Him. Our son was 1 ½ when we decided to attempt IVF again. We wanted another baby! Another friend of mine had one miracle son, and since it was taking much longer the second time around, she also went to see a fertility specialist. My news wasn’t what we had hoped; the doctor actually cancelled my cycle because I didn’t produce enough follicles to proceed, and that was using the protocol with the highest dosage. I was only 38. My friend also didn’t have good news – the doctor told her it was a miracle she got pregnant the first time and didn’t even recommend IVF for her. She was even younger than I. We both found out about the other’s results the same day at church, and I’ll never forget that day when we hugged and I said, in thankfulness and in tears, “At least God gave us both one son!” Then she told me to stop before I made her cry. I remember my nurse saying it wasn’t impossible for either of us to get pregnant, but it wasn’t worth paying that much for IVF for a 2% chance. A little over a year later, my friend called to tell me she was pregnant – 7 weeks along! I was thrilled for her, and her news also gave me hope that God could do the same for me. It just seemed destined to turn out that way. Her baby is now almost 6 months old, and no, I haven’t gotten pregnant. Most say I would be hoping against hope. True. Against hope, I am still believing in hope. (Romans 4:18-25) God is able. But if not, I will be ok. By God’s grace, I will still trust, praise, and serve Him. God is still good. If you are childless, perhaps not by your choice, then you can even identify with the sufferings of Christ greater than my own experience. I wonder if there is anyone who would give a word of encouragement by sharing how you have coped with this. How have you viewed God in the difficult times or when He didn’t deliver what you wanted? It may never get easy – the barren womb is never satisfied (Proverbs 30:15-16) – but if you can say God is still good, I would love to hear from you. Out of 365 days in the year, Mother’s Day was the most difficult in my experience with infertility. A flood of memories comes rushing in when I think about it. This special day, and the anticipation of it, was the hardest of all holidays and more emotional for me than baby showers and hospital visits to see newborns. At most churches, mothers are appropriately acknowledged with honor and a gift of appreciation. The first few years, I would feel so alone when all the mothers were asked to stand. I felt out of place and thought I stuck out, like everyone knew I wasn’t a mommy. The following may not be novel ideas, but I just wanted to share some thoughts on how we can become more proactive instead of reactive on Mother’s Day. One year we decided, “Let’s get away!” We went out of town for the weekend and still went to church. It was easier being away from our home church where no one knew I wanted to be a mom. At this church, they asked the grandmothers to stand first, then the mothers, and then they even asked wives to stand who weren’t mothers. I received a gift even though I wasn’t expecting to be included! One year instead of focusing on it not being my day to celebrate, we again went away for the weekend but to spend it with my mom and dad. Our mothers deserve all the recognition we can give them for their contributions and love and sacrifice. That was a special time. 3) Serve instead of sit. One year we could not get away for the weekend as we had in the past, but after talking with another friend who was also experiencing infertility, I decided I would try something different. She said Mother’s Day wasn’t difficult for her because she always served in the nursery that day. I thought I could try this. Instead of enduring the recognition during the church service, I volunteered to help in 3-year olds and a friend of mine helped me, since both the teacher and helper were out of town. We made pretty flowers out of tissue paper and pipe cleaners and sprayed perfume on them so the children could give them to their mothers. It turned out to be fun, especially with a friend! One year, I offered to take my friend’s place in the nursery so she could watch her daughter’s Mother’s Day music presentation. Then for lunch, we invited an elderly widow to our home. She had also never experienced the blessing of being a mother, but we wanted to show honor to her. After the first few years of wondering how I would survive another Mother’s Day, I realized I could celebrate the day and cope with the difficulty by honoring our moms and by serving in different capacities. I still shed some tears, but it made a difference deciding ahead of time how I would spend the day instead of reacting to the emotions this type of holiday brings forth. And the Lord always gave grace when I needed it. Another year, another Mother’s Day? Make it a different kind of Mother’s Day.